You know when it has snowed, and you catch yourself continuously glancing out of the window just to check it hasn�t melted yet? Well, my cockpit isn�t quite full of snow, but it is bright white. And I keep catching myself looking out of the window in my door to remind myself that, yes, I have actually painted the decks � and they look amazing. I can do this maintenance malarkey! After beginning the process the other week by sanding the decks down with my friend Jonny, it was then a matter of waiting for a weather window (and not using it go to sailing instead!). Voila! Over the Easter bank holiday weekend, I did a very British thing: some DIY. Albeit on my boat, not a house. I could probably have spent an indefinite amount of time sanding and filling the decks, but I didn�t want this to be a job that dragged out. And my view on tasks like this is, if it looks better than it did before, it�s a success. So once I was happy with the sanding preparation, I masked the entire foredeck, catwalks and cockpit sole & seats. (I am yet to do the tops of the coachroof and saloon.) Decks sanded and masked, I gave them a quick wipe-down with white spirit, and started painting. Whilst researching which non-slip paint to use, I came across a lot of people who use paints like Sandtex, which isn�t actually a marine paint. But people use it anyway, because it�s a lot cheaper than the stuff from the chandlers. 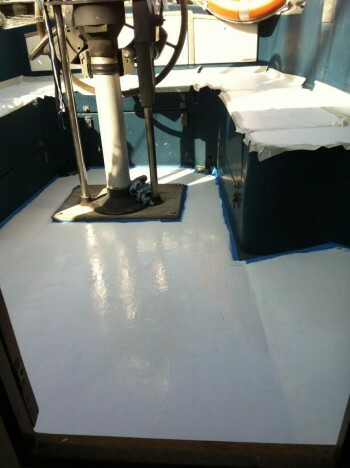 I considered using Sandtex, but I didn�t mind paying a bit extra for the proper marine deck paint � about �25 a tin for International�s Interdeck, pre-mixed with a non-slip additive. However, I didn�t realise I would end up needing four tins of paint for the entire boat! Still, it is well worth it: I have put two coats of paint on the foredeck & catwalks, and am just waiting for another weather window to put a second coat on the cockpit sole. The difference is amazing even just with the first coat, and it is very grippy to walk on when wet. The only difficulty I found was in obtaining Interdeck in the right colour � I bought the only two tins of white in the whole of Brighton marina, so had to take a trip to Newhaven when I realised I would need two more tins. Painting the cockpit was interesting. I had planned it carefully, as I didn�t want to trap myself and Bosun inside the boat until the paint dried. So, I left a square unpainted on the cockpit sole, just big enough to manoeuvre in and out of the boat without stepping in paint. And then my impatience won, and I decided to paint over that last square: I was dying to see what the entire cockpit would look like painted, so didn�t want to leave a patch unfinished. Spontaneity overtook planning, and I painted Bosun and I inside the boat. Getting out was fun: using the cockpit winches as foot holds, whilst using the mizzen boom to pull myself up on top of the saloon, all the while holding a wriggling Jack Russell under my arm.